Breaking from its customary juried selection process, “Arts Night Out” has invited eleven veteran artists to create masterpieces in chalk on the sidewalks of downtown during the sixth annual Northampton Chalk Art Festival on Friday, September 11. The competitive event kicks off a festive weekend that includes the Northampton Jazz Festival and the Northampton Arts Council’s RETROFAIRE. Drawing takes place from 10 am until 4 pm on Friday. The public is encouraged to watch chalk art pieces develop and to view completed work in the evening while enjoying Northampton’s monthly gallery walk 5-8 pm. Cash prizes of $300, $200, and $100 will be awarded by a panel of judges for the top three creations. Presentations are made on the steps of City Hall at 5 pm. The public is also invited to an informal family free draw 5-7 pm. Participants will be asked to help “decorate” the RETROFAIRE site located in the area between Thornes Marketplace and the city parking garage. Plenty of sidewalk chalk will be on hand for anyone who wants to take part in the activity. 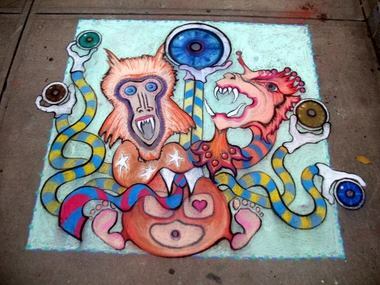 Individual chalk artists for 2015 include former prize winners and seasoned competitors Linda Babcock, Sally Curcio, Stephen St. Francis Decky, Jenn Falcon, Amy Johnquest, Robert Markey, Dean McKeever, Chrissy Neithercott, amd Sloan Tomlinson. They will be joined by two veteran teams: Stephanie Gerolimatos, Mark Bodah and Matt Rodriguez who form Team Bodalimadriquez and “The Living Art Studio” partners Scot Padget and Alisa Inderieden. Chalk art sites, except for the Smith College Museum of Art on Elm Street, are all located on Main Street: Ode; Memorial Hall; Pinch; the Artisan Gallery; Thornes Marketplace; the Mercantile; Cathy Cross/J. Rich; First Churches; Don Muller Gallery; William Baczek Fine Arts. Along the route, viewers have an opportunity to stop in at venues that participate in Arts Night Out. Maps of the chalk art locations will be available. 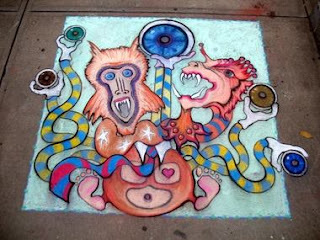 The Northampton Chalk Art Festival is sponsored by Chartpak, Inc. and the Northampton Radio Group. It is produced in cooperation with the City of Northampton and the Northampton Center for the Arts.